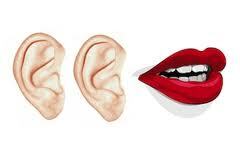 Two ears one Mouth: It is important to remember that we have two ears and one mouth. We need to listen to our teens twice as much as we talk to them. A common pitfall for many parents is that they like to lecture. Somehow we believe that our teens are taking us in, when in reality they are tuning us out. Saying the same thing more often has no impact on a teen, in fact it will lead to conflict. Are they rolling their eyes? Is the smirk on their face? Determine the temperature of the situation: how upset are you and your teen? Knowing your teen’s body language and how potentially explosive a situation is, will help you to decide what action to take. Do you and your teen need to cool down? If necessary take some time and cool down. 4. the effect the event has on YOU. You combine these pieces to form a sentence as follows: "I feel ____#2____ when ____#3____, because _____#4_____. For example - "I feel scared when you don't call to tell me that you will be late from school, because I worry that something might have happened to you." Make your statements from a positive frame of reference. Instead of “You’re lazy” try “I’m guessing you have a lot on going on, how can I help?”. Listen to what your teen is saying. Clearly state your expectations. Setting expectations for your son or daughter's behaviors lets them know you believe they can make smart and healthy choices.